The new ABS Auto-Release feature is designed to allow rapid mount and dismount without loosening any of the ABS sizing or contour fit adjustments. MAY® patents combine Posto Series technology with our contour hinge along with ABS (Articulating Back Support) designs to redistribute unwanted weight off of players’ shoulders resulting in comfort and freedom while promoting proper wellness posture. The ABS Posto Magnesium/Aluminum Tubular design is gender friendly with ultra lightweight construction, supporting a 1:1 real time extension of the performers elaborate maneuvers that are essential to contemporary band performances. The elimination of j-rods reduces previous interference issues, thus enhancing ergonomic comfort with complete freedom of movement for maximum performance. The multi-patented utility features result in the optimal carrier for wellness, comfort, and gender compatibility for a tailored fit. The contour hinge allows for independent upper and mid body contour adjustment, to custom fit a wide range of player sizes. The Posto Series carriers also feature a polycarbonate abdominal plate, which is flexure fitting to reduce point loading, and can be inverted to reverse the shape. Additional features include infinite torso height adjustment and reversible ABS positioning, for larger players. Shoulder positioning can be fine tuned by rotating the shoulder’s caster down (into the back) and/or pivoting the camber angle (toward/away from the neck). All Posto Series carriers include respective drum mounting hardware and come with carry-on bag providing easy transport and product protection. AUTO RELEASE ABS Contour Hinge MonoPosto Snare Marching Carrier includes Free Floating Snare Attachment hardware, accommodating both flat and traditional drum angle positioning. Features include ABS articulating back support, j-rod-free technology, gender-friendly tubular embodiment, ultra-lightweight magnesium/aluminum construction, multi-point comfort zones, and inverting abdomen plate. Additional benefits are reduction in dynamic movement of snare drum, drop and lock mount with rotating feature for at rest position. AUTO RELEASE ABS Contour Hinge BiPosto Tenor Marching Carrier includes drum attachment hardware for patented MAY FFLB tenor array. Features include ABS articulating back support, j-rod-free technology, gender-friendly tubular embodiment, ultra-lightweight magnesium/aluminum construction, multi-point comfort zones, and inverting abdomen plate. Additional benefits are reduction in dynamic movement of tenor drum array, drop and lock rail mount with rotating feature for at rest position. MAY FFLB (Free Floating Lug Bridge) spacers sold separately for use with traditional tenor drums. AUTO RELEASE ABS Contour Hinge MonoPosto Bass Marching Carrier includes mounting hardware with MonoPosto slider for precise drum positioning. Real-time adjustment with the carrier on facilitates all size bass drums resulting in pin point targeted playing zones. Features include ABS articulating back support, j-rod-free technology, gender-friendly tubular embodiment, ultra-lightweight magnesium/aluminum construction, multi-point comfort zones, and inverting abdomen plate. Additionally, dynamic movement of bass drum (backlash) is eliminated, securely attached by the locking conical fastener. The reduced size Posto Series Carriers w/ ABS Auto-Release have all of the features/benefits technology as their parent models with scaled down (reduced) sizing specifically tailored for smaller framed players. These scaled down components utilize smaller shoulder members (both in length and radius), shorter tubular frame, inverted abdomen plate, and repositioned ABS. Patented MAY® Aluminum Tubular carriers feature ergonomic lightweight design with multiple adjustments to enhance comfort. These carriers are gender-friendly, tubular embodiments, with adjustments to fit a wide range of student sizes. The newly designed, tapered aluminum Ab plate (powder coated black) can be inverted to reverse the shape. 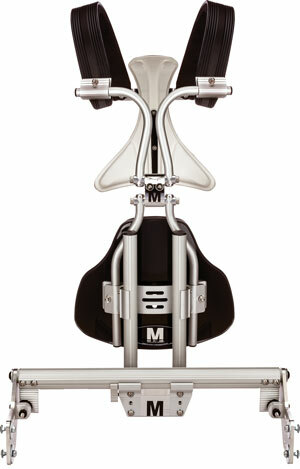 Other features include torso height adjustment and a wide range of shoulder adjustments to maximize weight distribution. Shoulder positioning can be fine tuned by rotating the shoulder’s caster down (into the back) and/or pivoting the Camber angle (toward/away from the neck). The adjustable, lineal back bar facilitates additional shoulder adjustment and back bar support, with removable MAY Comfort Core Cushion. 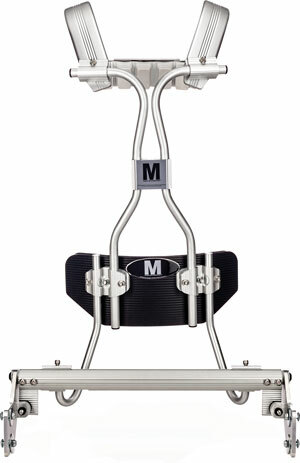 All MAY® Aluminum Tubular carriers include respective traditional j-rod receiving drum mounting hardware. Patented MAY Aluminum Tubular Snare carrier with j-rods includes Free Floating Snare Attachment hardware, accommodating both flat and traditional drum angle positioning, with rotating feature for at rest position. Features include gender-friendly tubular design, lineal adjustable shoulder backbar, and tapered, inverting abdomen plate. Patented MAY Aluminum Tubular Tenor carrier with traditional j-rods includes attaching tenor drum hardware for the new patented MAY FFLB, which fits both small and large marching tom set, with rotating feature for at rest position. Features include gender-friendly tubular design, lineal shoulder backbar, and tapered, inverting abdomen plate. MAY FFLB Free Floating Lug Bridge spacers sold separately for use with traditional tenor drums. 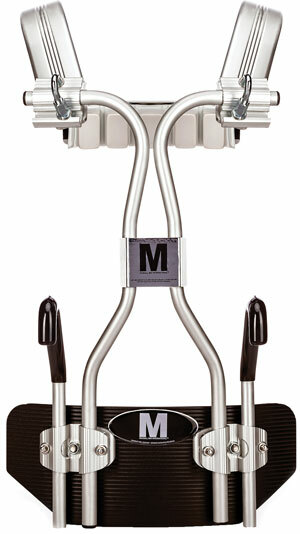 Patented Aluminum Tubular Bass carrier with j-rods includes drum hardware for marching bass drum. Features include gender-friendly tubular design, lineal adjustable shoulder backbar, and tapered, inverting abdomen plate. All MAY carries and/or mounting hardware are covered under various patents but not limited to: 6,323,407 6,172,290 6,403,869 7,071,401 RE-42487 7,673,776 7,166,790, 7,420,110 7,326,842 7,810,684 7,394,008 8,053,655 8,646,666 8,598,443 with multiple patents pending. All MAY Stadium Hardware™ stands and MAY Airlift™ are covered under various patents but not limited to 7,703,725 7,588,228 7,438,266 7,718,878 8,633,365 with multiple patents pending.